You can stitch images together manually or automate the process. A handy piece of software - perfect for those holiday shots of the Grand Canyon. Compared with the peripheral capabilities of a pair of standard human eyeballs, most digital cameras with even the widest angle lenses are sadly lacking. Grand vistas lose more than a little in the translation to digital image but this software enables you to take several photos as you pan both vertically and horizontally around a scene, and then stitch the resulting images together into an altogether bigger and therefore higher-resolution picture. There's a fully automatic stitching process available which works quite well most of the time, but for when things get a little tricky, as they often tend to do with panoramic images, the new version of Stitcher Express has a semiautomatic, manual and even a fearsome sounding 'forced' stitching mode to bring everything together with an excellent degree of precision. Extreme zoom can be applied in the preview mode to help you pinpoint areas in images that you want to join together. Once an image is stitched, you can preview, check and then render your final panoramas into snapshot or cylindrical views, as well as complete 360x180-degree scrollable spheres in QuickTime VR format. A neat 3D interface provides for drag and drop simplicity, although rendering the final image can take several minutes to complete. For larger sizes of images we found that our reasonably well equipped PC with 1Gb of memory ran out of steam altogether, with an 'out of memory' message being flashed up before the program quit completely, without even saving the current project first. So if you're planning to work on large projects, you'd better get a memory upgrade! 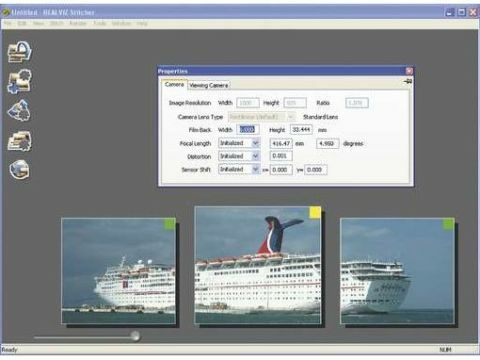 Several on-screen tutorials are included in order to help you to get to grips with the software, which is fast and precise for automatically or manually stitching images into a panorama. Previewing and rendering final images and QuickTime VR panoramas proved rather trickier and prone to error in our tests. It's advisable to upgrade your PC's memory first.